October 4, 2016 – A subsurface ocean lies deep within Saturn’s moon Dione, according to new data from the Cassini mission to Saturn. 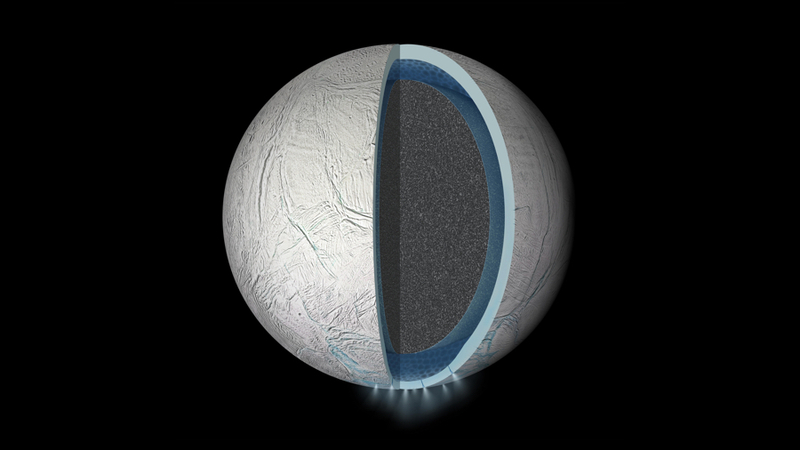 Two other moons of Saturn, Titan and Enceladus, are already known to hide global oceans beneath their icy crusts, but a new study suggests an ocean exists on Dione as well. In this study, researchers of the Royal Observatory of Belgium show gravity data from recent Cassini flybys can be explained if Dione’s crust floats on an ocean located 100 kilometers below the surface. The ocean is several tens of kilometers deep and surrounds a large rocky core. 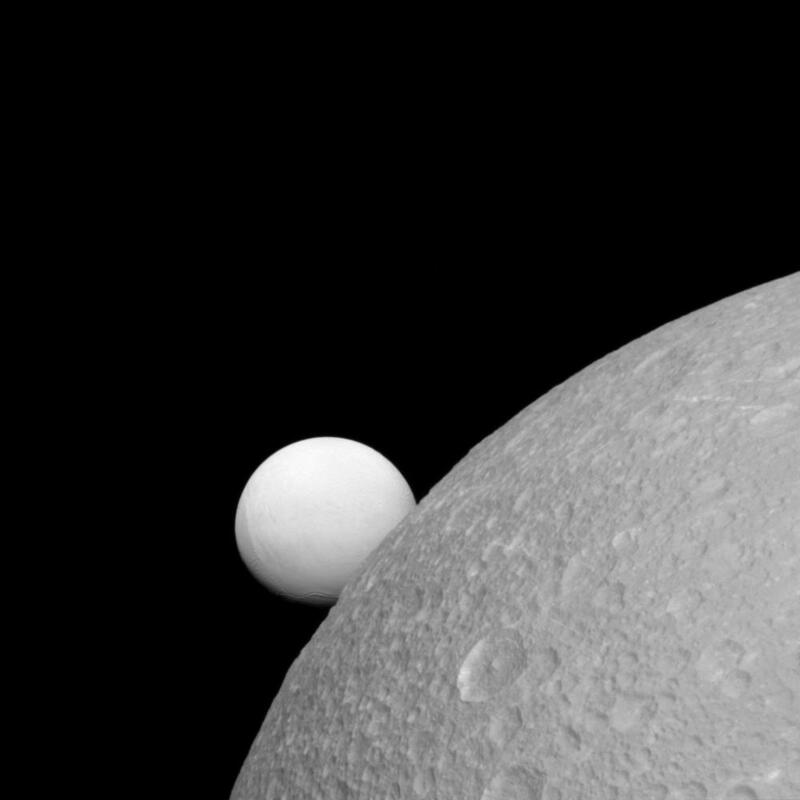 Seen from within, Dione is very similar to its smaller but more famous neighbor Enceladus, whose south polar region spurts huge jets of water vapor into space. Dione seems to be quiet now, but its broken surface bears witness of a more tumultuous past. The study is published online this week in Geophysical Research Letters. According to the new study, Enceladus’ ocean is much closer to the surface, especially near the south pole where geysers erupt through a few kilometers of crust. These findings agree well with the discovery last year by Cassini that Enceladus undergoes large back-and-forth oscillations, called libration, during its orbit. Enceladus’ libration would be much smaller if its crust was thicker. 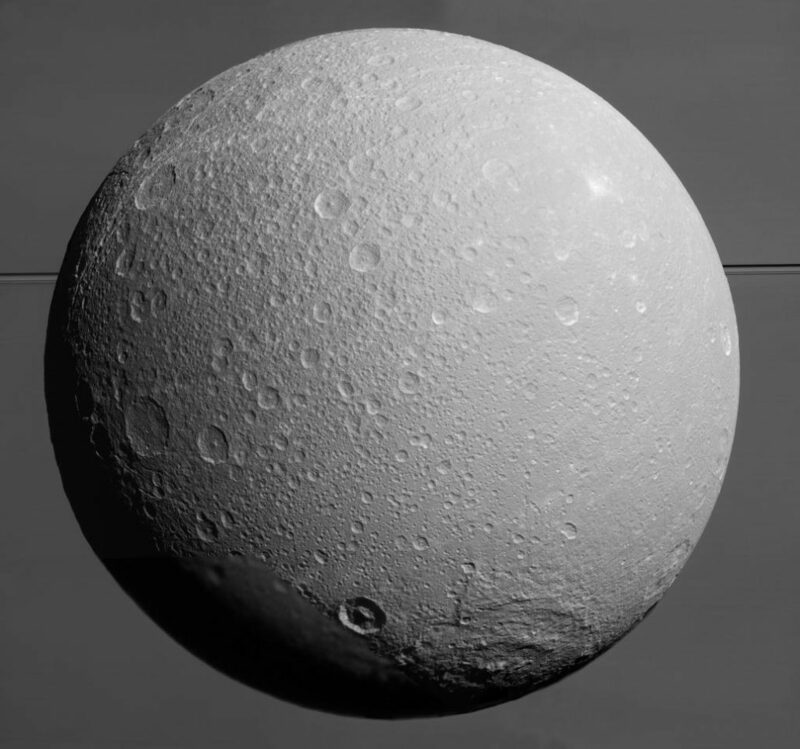 As for Dione, the new study finds it harbors a deep ocean between its crust and core. Dione’s ocean has probably survived for the whole history of the moon, and thus offers a long-lived habitable zone for microbial life. “The contact between the ocean and the rocky core is crucial”, said Attilio Rivoldini, co-author of the study. “Rock-water interactions provide key nutrients and a source of energy, both being essential ingredients for life.” The ocean of Dione seems to be too deep for easy access, but Enceladus as well as Jupiter’s moon Europa are generous enough to eject water samples in space, ready to be picked up by a passing spacecraft. The club of “ocean worlds” — icy moons or planets with subsurface oceans in common parlance — gains new members with each new mission to the outer solar system. Three ocean worlds orbit Jupiter, three orbit Saturn and Pluto could also belong to the club, according to recent observations of the New Horizons spacecraft. The approach to modeling planetary bodies used in this study is a promising tool to study these worlds if we can measure their shape and gravity field, according to Mikael Beuthe. “Future missions will visit Jupiter’s moons, but we should also explore Uranus’ and Neptune’s systems”, he said.